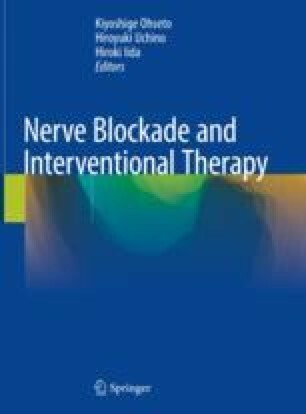 Some patients with lower back and leg pain do not respond to lumbar epidural blocks, and no distinct findings are found on magnetic resonance imaging. Such patients may include patients with sacroiliac joint pain. A sacroiliac joint block is used for the diagnosis and treatment of sacroiliac joint pain; it is an important blocking procedure from both therapeutic and diagnostic viewpoints. Although X-ray fluoroscopy-guided sacroiliac joint blocks were predominant in the past, ultrasound-guided blocks are currently common. In some cases, performing infiltration anesthesia in the ligaments (posterior sacroiliac ligament and interosseous sacroiliac ligament) posterior to the sacroiliac joint achieves a blocking effect similar to that of injections into the sacroiliac joint cavity.